Little has changed in supply chain management theory since Forrester’s groundbreaking study over 50 years ago showing the correlation between a company’s success and the interrelationships between company functions and its network of suppliers and customers. Forrester identified a system consisting of five key dynamic “flows.” Information, materials, money, manpower, and capital equipment determine the basic tendencies towards growth or decline of a company. What has changed, however, is the need to proactively manage these flows and the need to shift from traditionally fragmented architectures to more effective, integrated flows across both internal and external chains. Information and communications technology (ICT) plays a crucial role in how external customer and supplier relationships are managed. Since the flow of materials or money is usually triggered by related information movement, effective information flow directly affects the rest of the system and can significantly improve overall efficiency. Sharing information effectively and accurately across an entire supply chain is a complex undertaking considering the number of access points, systems, real-time update requirements and participants at each location. Sometimes, it can feel like a game of “Telephone,” with critical data lost along the way. But unless your supply chain management partner has all the information related to your business on a single ERP system, that is exactly what can happen. That is a lot to ask, and not all partners have systems that are up to the job. Supply Technologies’ integrates six key technologies with our one ERP application to insure every facet of every customer’s program is accessible 24/7/365 from any device, anywhere. Intranet – We utilize internal sites for project management, document sharing, brainstorming and report delivery. Apps – Our best-in-class applications are designed for one specific function and are fully integrated with our core transactional system, our warehouse management system, our financial consolidation and forecast/planning system and our product planning system. 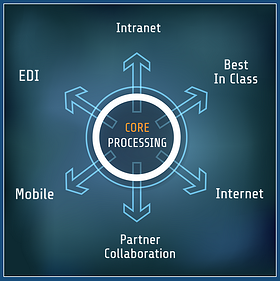 EDI – We are able to transact the full gamut of AIAG documents with both vendors and customers. Partner Portals – Easy-to-use portals foster collaboration by providing information to our business partners in real time. Mobile – Custom applications allow us to deliver information and content to any device on any operating system. Internet – We also leverage the Internet in whatever ways it gives us opportunity to add value along the supply chain. And, that platform must allow for flexibility, transparency and interoperability with a customer’s own system, even if that is a conglomeration of legacy systems. Effective management of information flow eliminates inefficiencies, most notably the need for excessive inventory levels. By implementing a consistent platform that integrates your entire supply chain, data visibility increases and breakdowns are significantly reduced. Want to learn how information flow can be improved across your entire supply chain? We will be happy to review your current process with you and identify potential areas of improvement.